For venting, this helmet features a full exhaust ventilation system including a chin bar vent that is sculpted to direct fresh air toward the inside of the shield. This provides even more anti-fog capabilities. Also, the internal foam uses "open cell" technology to provide more circulation. The interior liner and cheek pads are easily removable and cleanable. 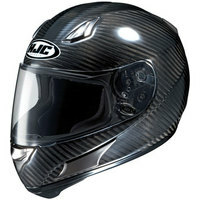 The helmet is designed to be lightweight, and has two shell sizes to ensure the perfect fit. Fox Racing makes their carbon fiber helmet with a bit more pizzazz, as seen in the Latinese V3.